Winter Soldier Iraq and Afghanistan: Eyewitness Accounts of the Occupation, published by Haymarket Books Tuesday, is a gut-wrenching, historic chronicle of what the U.S. military has done to Iraq, and its own soldiers. Authored by Iraq Veterans Against the War (IVAW) and journalist Aaron Glantz, the book is a reader for hearings that took place in Silver Spring, Md., between Mar. 13-16, 2008, at the National Labor College. "I remember one woman walking by," said Jason Washburn, a corporal in the U.S. Marines who served three tours in Iraq. "She was carrying a huge bag, and she looked like she was heading toward us, so we lit her up with the Mark 19, which is an automatic grenade launcher, and when the dust settled, we realized that the bag was full of groceries. She had been trying to bring us food, and we blew her to pieces." Washburn testified on a panel that discussed the rules of engagement in Iraq, and how lax they were, even to the point of being virtually nonexistent. "During the course of my three tours, the rules of engagement changed a lot," Washburn’s testimony continues. "The higher the threat the more viciously we were permitted and expected to respond." His emotionally charged testimony, like all of those in the book that covered panels addressing dehumanization, civilian testimony, sexism in the military, veterans’ health care, and the breakdown of the military, raised issues that were repeated again and again by other veterans. "Something else we were encouraged to do, almost with a wink and nudge, was to carry ‘drop weapons,’ or by my third tour, ‘drop shovels.’ We would carry these weapons or shovels with us because if we accidentally shot a civilian, we could just toss the weapon on the body, and make them look like an insurgent," Washburn said. Everything from the taking of "trophy" photos of the dead to the torture and slaughter of civilians is included. "We’re trying to build a historical record of what continues to happen in this war and what the war is really about," Glantz told IPS. "One time they said to fire on all taxicabs because the enemy was using them for transportation. One of the snipers replied back, ‘Excuse me? Did I hear that right? Fire on all taxicabs?’ The lieutenant colonel responded, ‘You heard me, trooper, fire on all taxicabs.’ After that, the town lit up, with all the units firing on cars. This was my first experience with war, and that kind of set the tone for the rest of the deployment." Vincent Emanuele, a Marine rifleman who spent a year in the al-Qaim area of Iraq near the Syrian border, told of emptying magazines of bullets into the city without identifying targets, running over corpses with Humvees, and stopping to take "trophy" photos of bodies. "An act that took place quite often in Iraq was taking pot shots at cars that drove by," he said. "This was not an isolated incident, and it took place for most of our eight-month deployment." Kelly Dougherty, the executive director of IVAW, blames the behavior of soldiers in Iraq on the policies of the U.S. government. "The abuses committed in the occupations, far from being the result of a ‘few bad apples’ misbehaving, are the result of our government’s Middle East policy, which is crafted in the highest spheres of U.S. power," she said. "You see an individual with a white flag, and he does anything but approach you slowly and obey commands, assume it’s a trick and kill him," Michael Leduc, a corporal in the Marines who was part of the U.S. attack of Fallujah in November 2004, said were the orders from his battalion JAG officer he received before entering the city. 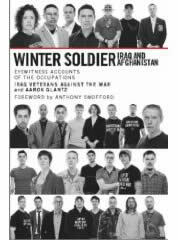 This is an important book for the public of the United States, in particular, because the Winter Soldier testimonies were not covered by any of the larger media outlets, aside from the Washington Post, which ran a single piece on the event and buried it in the Metro section. The New York Times, CNN, and network news channels ABC, NBC, and CBS ignored it completely. This is particularly important in light of the fact that, as former Marine Jon Turner stated, "Anytime we did have embedded reporters with us, our actions changed drastically. We never acted the same. We were always on key with everything, did everything by the book." the true face of war." Dehumanization of the soldiers themselves is covered in the book, as it includes testimony of sexism, racism, and the plight of veterans upon their return home as they struggle to obtain care from the Veterans Administration. There is much testimony on the dehumanization of the Iraqi people as well. Brian Casler, a corporal in the Marines, spoke to some of this that he witnessed during the invasion of Iraq. "But on these convoys, I saw Marines defecate into MRE bags or urinate in bottles and throw them at children on the side of the road," he stated. Numerous accounts from soldiers include the prevalence of degrading terms for Iraqis, such as "hajis," "towel-heads," and "sand-n*ggers." Scott Ewing, who served in Iraq from 2005-2006, admitted on one panel that units intentionally gave candy to Iraqi children for reasons other than "winning hearts and minds." "There was also another motive," Ewing said. "If the kids were around our vehicles, the bad guys wouldn’t attack. We used the kids as human shields." Glantz admits that it would be difficult for the average U.S. citizen to read the book, and he believes it is important to keep in mind while doing so what it took for the veterans to give this historic testimony. "They could have been heroes, but what they are doing here is even more heroic  which is telling the truth," Glantz told IPS. "They didn’t have to come forward. They chose to come forward."